Kelly-Jo Bluen joins JiC for this critical take on the trial of Hissène Habré and the need to pursue justice for all parties responsible for atrocities in Chad. Kelly-Jo is the project leader for international justice at the Institute for Justice and Reconciliation based in South Africa. The trial of former Chadian President Hissène Habré in Senegal last week reflects many of the tensions afflicting international justice. Habré, who is charged with crimes against humanity, torture, and war crimes, relating to the death of an alleged 40,000 people between 1982 and 1990, denounced the court as a colonial project before being forcibly removed from the courtroom. The trial was subsequently postponed until 7 September, for Habré’s defence counsel to review court files. The Dakar-based Court where Habré is being prosecuted is the Extraordinary African Chambers (EAC), an African Union mandated chamber with jurisdiction to prosecute “the person or persons most responsible for crimes and serious violations of international law” in Chad between 7 June 1982 and 1 December 1990. This trial presents a critical juncture to reflect on two pertinent issues, both for the case and for the international justice architecture. First, in light of the well-documented role of Western powers in the Chadian conflict’s Cold War dimensions, and those that preceeded them during French colonial rule, the trial presents an opportunity to consider more expansively who “the persons most responsible” for gross atrocities might be in Chad. Second, and related to the divorce between complicity and accountability in the face of politics, the Habré case is revealing in terms of how notions of accountability are framed within the existing lexicon of international criminal justice. Unequivocally, the prospect of accountability for Habré is extremely important. A 2010 Human Rights Data Analysis group report that analysed evidence from the Chadian Documentation and Security Directorate (DDS) details abuse, torture, summary executions, and murder, as well as Habré’s knowledge of the abuse. With the explicit aim “to bloody Qaddafi’s nose” and “to increase the flow of pine boxes back to Libya,” Reagan and the CIA enlisted Habré a former Defense Minister who had been based on the Chad-Sudan border since his thwarted attempt on the Presidency in 1980. Habré’s ascent to presidency was seen as critical to the anti-Gaddafi campaign. 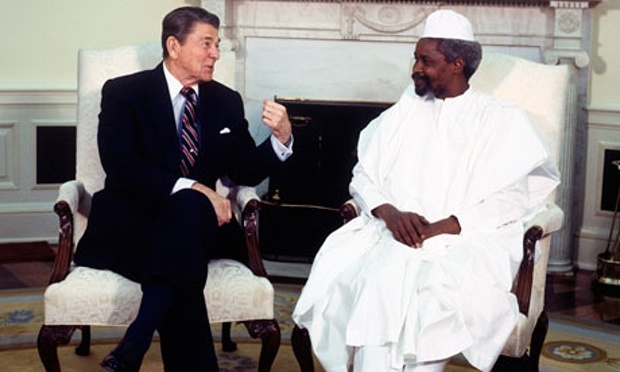 President Reagan subsequently signed a formal intelligence order releasing several million dollars in covert support to Habré and, by June 1982, the future Chadian leader and 2,000 of his troops, armed and funded by the US, had reached N’Djamena and Habré assumed the presidency in Chad. In addition to covert financing, the US provided an estimated $182 million in military and economic assistance during Habré’s Presidency. It provided machine guns, jeeps, missiles, surveillance aircraft, among other military hardware. A document from the DDS obtained by Human Rights Watch details training in the US in 1985 of Chadian security agents. Two of those who underwent training were found, during the Chadian Truth Commission to be Chad’s “most feared torturers”. While the US covert operation was instrumental in cementing and maintaining Habré’s presidency, Chad was a Cold War geopolitical quagmire. Ariel Sharon, then Prime Minister of Israel agreed to provide aircraft weapons, advisors and, together with President of Zaire (present day Democratic Republic of the Congo), Mobutu Sese Seko, provided training for Habré’s troops in concert with the Zairian military. France’s complicity is altogether more expansive and structural. France, which (officially) colonised Chad until 1960 employed a policy characterised by deliberative disunity between and within the predominantly Muslim north and predominantly Christian South. French colonial officers exploited differences to their advantage, instrumentalising cleavages for purposes of maintaining power and resources. Indeed, the very tensions that fomented decades of civil war and oppression in Chad, so readily dismissed by many Western analysts as “tribal” were entrenched by French colonialism. 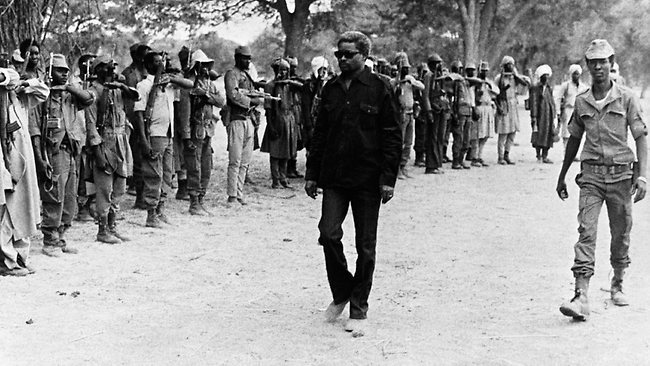 In the course of Habré’s presidency, keen to maintain its neocolonial hold on Chad, and blighted by the increasingly prominent role of the US in Chad, France supplied 3,000 troops, logistical support, equipment, and air power for Habré. During the course of the Presidency of François Mitterand, the French campaign in Chad from 1983 to 1984 was France’s largest military intervention since Algeria. In addition to the atrocities committed by US and French forces in the course of the Chadian-Libyan war, western powers were aware and not deterred by the executions and torture being committed by Habré’s security forces in Chad, which in many cases using weaponry, finance, and training provided through by their Cold War allies. An Amnesty International Report as early as 1983 detailed the abuses taking place in Chad. In 2000, a former senior U.S. official remarked, “it is fair to say we…chose to turn a blind eye.” Perhaps the clearest indication of this approach was in June 1987, when President Habré was invited to the White House where President Reagan remarked, “today President Habre emphasized that his government is committed to building a better life for the Chadian people…I assured him that we will continue to do our best…to help reach President Habre’s laudatory goals”. International complicity in Chadian atrocities is hardly a secret. Human rights groups, analysts, historians and even the most conservative, status quo Western media outlets refer to Habré as a “western-backed dictator” and many acknowledge the specificites of Cold War dynamics. What is perplexing, but unsurprising then, is the disjuncture between this acknowledgement, and the determination of the appropriate course of action. Western complicity is treated as an unfortunate throwaway eventuality, stripped of its egregious role in the conflict. It is particularly telling that both the US and France are EAC donors, donating $1 million and €300,000 respectively towards the Chambers’ budget. Temporally, the court has jurisdiction to prosecute international crimes committed from 1982 to 1990. While this precludes accountability for the destruction and systemic preconditions to conflict created by French colonialism, it does include within its timeframe Western responsibility during the Cold War. The Court, however, will try only Hissène Habré as delineated by the prosecution. On the implications of international backing for the case, EAC Prosecutor Mbacké Fall notes, “neither France nor the US felt concerned by the Habré regime’s massive human rights violations. But, having said that, I don’t think it will have an incidence on Habré’s guilt.” There is no scope, at this point, for criminal justice or other forms of accountability for Habré’s Western allies. The Habré case, perhaps most poignantly, illustrates the politics of a singular focus on individualised criminal accountability and the problematics of negating internationalisation. Without diminishing the importance of holding Habré accountable, it should be noted that he is not singularly responsible. While the precepts of individualised accountability for gross crimes are important, in individualising, and particularly in individualising within the framework of contrived temporal jurisdictional limitations, two critical factors are excluded. First, we exclude accountability for historical complicity in proliferating structural conditions which cause violence because they precede the proscribed temporal mandate. Second, the language around individualised accountability, derived from a specific set of liberal ideas preclude accountability for external actors, in localising that which is often international and designating responsibility and command in ways that exclude external actors. There is thus is a disjuncture between much of the vocabulary surrounding international criminal justice and the realities it seeks to address. Many conflicts, and specifically those in a Cold War context of protracted neo-colonial relationships are internationalised. The selectively-employed concept of “sovereignty” is flaccid where external advisors, funders, and patrons have the power, through capacity support, technical training, weapons, and money, to directly influence politics. The lenses offer us “civil war” despite international sponsorship and “state terrorism” despite transnational frameworks. In so doing, they allow for the continued entrenchment of a dichotomy which posits a well-behaved West in opposition to a barbaric Africa. In this context, and specifically in Chad, where there is such an apparent a link between the atrocities committed and the US and French governments, prosecuting domestic actors in isolation without assessing international ones cannot purport to do justice in a fashion that is truly international. Again, this is not to suggest that Habré should not be held accountable; he should. But the focus on Habré to the exclusion of other powerful actors is insufficient and unjust in the context of layered and internationalised complicity for crimes. This entry was posted in African Union (AU), Chad, Guest Posts, Hissène Habré, International Criminal Justice, Senegal, Special African Chamber (CAE), War crimes. Bookmark the permalink. International justice is unattainable, has never been, and will never be under the international norms/arrangements that pertains. More “powerful” nations will continue to dominate, force, and bully “weak” nations. It will always be a “do what I say and not what I do” situation. So, for now, all we can do is to keep talking … unless “people justice” takes over. Justice more frequently is the conflict, within a world of diversity and difference. Principals of corporate law are recognized in this case of a nation with administration of morals and policy during a period and place particular of relational engagements. If anything the transparency of this conundrum could open an aged system to truth and reconciliation. Very good article. My experience as a trial lawyer at the ad hoc tribunals (ICTY and R) and my limited experience but studious following of the ICC is that international justice has been criminalised, that is that the very people who commit the crimes and set the conditions for them are never brought to account but use these tribunals to put out false versions of the conflicts, to justify them, cover up their own role on these conflicts and use them to suppress the opposition forces in a given country for their benefit. I have seen the prosecution in these tribunals use every trick in the book and more to convict. But here is a link to a paper I presented in 2014 at the Rhodes Forum, Rhodes, Greece on what goes on at these tribunals.